NHL team wants to put ticket resales on ice | Marketplace.org. It is an interesting idea. It could work or it could backfire. There is nothing to prevent the team from discriminating against who purchases the tickets. Nor is there any safe guard that they won’t double the price and increase their bottom line. It appears that we are at a tipping point with the live streaming of sporting events. While the rumblings have been there for many years it finally seems like we are about to crossover into a world where you will finally have a choice between your typical cable or satellite subscription and an online only version. The surprise shouldn’t be that we’ve gotten to this point but it should surprise people that Yahoo could have led this change. Yahoo is a big company with an enterprise value around $35 billion. It employs over 10,000 people but is has also had enough drama in the C Suite to fill a CNBC special. One direction it didn’t pounce on when it had the chance was the realm of live streaming. Tracking Yahoo’s live streaming opportunities goes all the way back to 1999 when they purchased Broadcast.com for $5.7 billion and in the process making Mark Cuban a billionaire. Since then Yahoo has been live streaming various types of content from SEC football games on Jefferson Pilot to UFC events (free and paid). Now it is streaming a concert a day with its Yahoo Live platform. So why isn’t Yahoo synonymous with live streaming sports? They clearly have the cash, infrastructure, and smarts to pull it off yet here they sit on the sidelines as Dish Network launches Sling.com. Going through three CEO’s in 2012 alone probably didn’t help matters but one has to wonder why a company with a giant user base and brand name didn’t gain the digital rights of various sporting league? Expense was probably one of the reasons. Look the NFL and Premier League rights are not cheap by any means of the imagination. Even with a presumed 70-30 split you’d have to figure that access to Yahoo’s users and prominent placement on the homepage would have led some leagues or college conferences for that matter to think long and hard about a deal with Yahoo. Just think where Yahoo would be today if they had thought outside of the box when it came to the live streaming of sports. Imagine soccer matches rom around the globe, collegiate athletics or even something as niche as the Canadian Football League all being streamed via Yahoo. How did Yahoo not lock up the digital rights to the PAC-12 when they launched there network a few seasons ago? They are in the same zipcode! Yes hindsight is 20/20 but the opportunities where there. From it’s original purchase of Broadcast.com in 1999 to now with it’s daily live streaming of concerts from across the country. Yahoo has had opportunity after opportunity. Now as the sports landscape shifts to a true anywhere, anytime on any device environment, Yahoo sits on the sidelines wondering why it’s on the bench. Better Than The Actual Wreck? Danica Patrick is one of the few drivers in NASCAR (and auto racing in general) who transcends the sport. Whether you are a sports enthusiast or not you know her name. So when she wrecks on the track it’s a big deal. It’s an even bigger deal when she confronts another driver off the track. The wreck, like any wreck on a racetrack, is something to see. In this case it runs second fiddle to what happened afterwords when Patrick confronted Denny Hamlin. While not something NASCAR probably wants to see, it’s probably the best unpaid promotion they could have received before the biggest race of the year. The Daytona 500 is the biggest event of the year for NASCAR. While talk of NASCAR’s demise has leveled off in the past few years, it’s still not in the massive growth phase that it was in the mid 2000’s. In a strange way, an incident like the one we saw Thursday can only help the sport. Probably more so than whoever wins the race. Patrick will have her supporters and her critics. You cannot deny that she brings interest to NASCAR and the sport of auto racing in general. If she has a confrontation at the track with another drive it is always going to be newsworthy. You have to imagine that the NASCAR brass is secretly giving each other high-fives. Nashville Predators at NY Islanders – 4pm NHL Gamecenter: A battle of division leaders. Vancouver Canucks at NY Rangers – 4pm NHL Gamecenter: Well if the game on Long Island doesn’t do anything for you than this one should. San Antonio Spurs at LA Clippers – 7:30pm TNT: Just a fun match up. Toronto Raptors at Atlanta Hawks – 4pm NBA League Pass: Division leaders square off in HotLanta. Boston Bruins at St Louis Blues – 5pm NHL Gamecenter: St Louis is probably the best team in the NHL. The Bruins are fighting for a playoff spot. Should be fun. Anaheim Ducks at Calgary Flames – 6pm NHL Gamecenter: These Ducks have to fly north for a night and try to knock off the surprisingly good Flames. San Antonio Spurs at Golden State Warriors – 7:30pm ESPN: Defending champs head into Oakland to take on one of the best teams in the league. Iowa State Cyclones at Texas Longhorns – 11am ESPN2: Frank Erwin Center in Austin can be a tough place to pay. Upset alert! Pittsburgh Penguins at St Louis Blues – 5pm NHL Gamecenter: Tough back to back games for the Blues but if anyone can handle it it’s them. UCLA Bruins at Arizona Wildcats – 6pm ESPN: Something tells us that Arizona should be careful. LA Kings at San Jose Sharks – 6:30pm NBCSN: Outside at Levi Stadium. It would be more fun if it was at old Candlestick Park but we’ll take what we can get. Dayton 500 – 10am FOX: Nascar is back. Jeff Gordon in his final season took the pole in Daytona. Let’s go racin’! Ohio State at Michigan – 10am CBS: It’s usually a good football and a lot of times a better basketball game. Boston Bruins at Chicago Blackhawks – Noon NBC: It’s hockey day in America. You’re welcome. Memphis Grizzlies at Portland TrailBlazers – 6pm NBA League Pass: A nice way to end a great sports weekend. 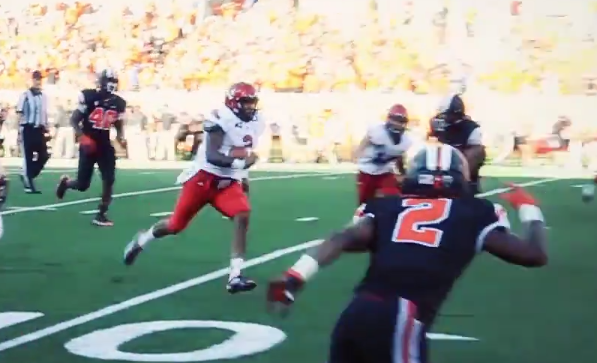 Vernon Adams. It’s ok if you have never heard of him but he is the one causing a major ruckus on the college football landscape. Not because of what he has done the past three seasons at Eastern Washington but because he’s leaving there to play his final season at Oregon. Adams is a 22 year old from Pasadena, CA. He started at quarterback for three years at Eastern Washington but since he is graduating in May he is taking advantage of an NCAA rule that allows him to transfer without having to sit out a year. While Eastern Washington is letting him go they are making it very clear that they do not like the rule. They don’t like it so much that they are barring Adams from using the football facility or working out with his former teammates while he finishes up his degree. Other coaches at the Football Championship Subdivision (FCS) level are not happy with what this could mean for the future. Montana State coach Rob Ash is among those speaking out against the rule because it makes the FCS seem like a developmental league. The fear is that this could start a trend where fifth year FCS players leave for the big schools like Oregon or a Michigan who get to reap the rewards of a veteran collegiate player. It’s not just the FCS that has to worry. Ohio State head coach expressed his unhappiness with certain members of the media trying to entice Ohio State quarterback Braxton Miller to transfer. Nor is transferring a guaranteeing you a starting spot. Just ask Jake Coker who transferred from Florida State to Alabama this past summer. Transfers are nothing new to collegiate athletics. Players have been doing it for years and it mostly goes unnoticed. When it comes to quarterbacks though, it tends to get a lot attention. Super Bowl winning quarterback Russell Wilson left North Carolina State for Wisconsin and promptly led Wisconsin to the Rose Bowl. While Wilson’s case was unique (he was essentially told by the NC State coaching staff that future pro Mike Glennon was going to play over him) it now seems that everyone is looking for an experienced QB to step in and lead the team to the promised land. With all of the pressure put on coaches nowadays can you blame them for looking for an experienced QB to step in? Players always have their reasons for transferring. It’s not fair to Eastern Washington that Adams is transferring but neither would be holding him back because you don’t want him to leave. In the business world there are ‘non competes’ and there is a similar thing in college football too where a coach will put restrictions on where a player can transfer. Eastern Washington could have done this since they play Oregon the first week of the season but it would have been a bad PR move. Is Adams setting a trend for FCS players? Probably not because too many things have to fall into place for something like this to happen. Are you going to see more situations like this? Sure but it’s no sure fire way to win championships. Remember, Russell Wilson may have led Wisconsin to the Rose Bowl but they ended up losing to Oregon. Dean Smith died at his home Saturday night at the age of 83. He suffered from dementia, a condition that robbed him of his memory. He is not the only legendary basketball coach being inflicted with dementia. Former University of Tennessee women’s basketball coach Pat Summitt suffers from Alzheimer’s which is a common cause of dementia. Dementia should be filed under ‘horrors of the world’. It is a combination of symptoms that effect the memory. Just imagine for a moment living a full and fruitful life and then not being able to remember the things you’ve done or people you have loved. Dean Smith wasn’t able to sit back and bask in his accomplishments and neither will Pat Summitt. All the championships, the wins, the players, the relationships and the great moments are eventually lost from memory. Tommy Tomlinson wrote an incredible piece last March about Dean Smith and what he was going through. 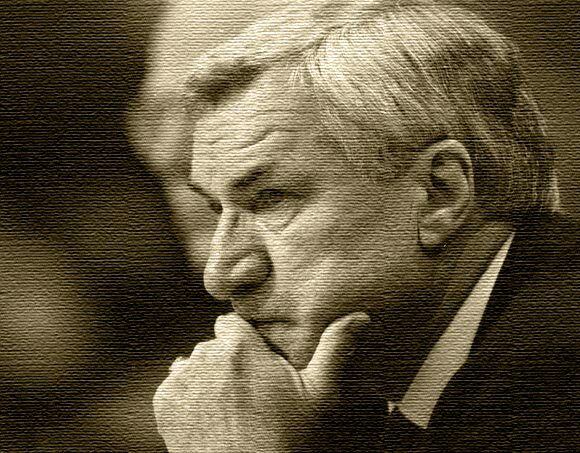 On this day where the basketball world remembers Dean Smith, it is a sobering read. Anaheim Ducks at Washington Capitals – 4pm NHL GameCenter: It’s a tough road trip for the Ducks who are the best team in the NHL by points. But Nashville one night and then DC the next might be too much. LA Clippers at Toronto Raptors – 4pm ESPN: Two of the top teams in the NBA face off north of the border. Golden State Warriors at Atlanta Hawks – 4:30pm NBA League Pass: This is the marquee game of the weekend. The Hawks once reeled off 19 wins in a row and the Warriors are just as good. In fact they only have 17 losses between them. Tottenham vs Arsenal – 4am NBCSN: It’s the North London Derby. Enjoy. Everton vs Liverpool – 9:30 am NBC: It’s another Derby except this one is north of London and USA National Team Goalkeeper Tim Howard returns for Everton. Notre Dame at Duke – 10am CBS: Top ten matchup and an ACC matchup which is still crazy to think about. All in one of the best venues in all of sports. NY Rangers at Nashville Predators – Noon NHL GamerCenter: The Predators are one of the top teams in the NHL and are nearly unbeatable at home. The Rangers are coming off a big win against Boston but goalie Henrik Lundqvist isn’t 100% and they are going to need him against the Preds. Louisville at Virginia – 4pm ESPN: Man is this a tough stretch for Virginia. They win this one and it’s 2-1 against Duke, UNC and Louisville. Not bad. Now they have to win. Portland TrailBlazers at Dallas Mavericks – 5:30pm NBA League Pass: This is a playoff preview game. Enjoy. Chicago Blackhawks at St Louis Blues – 9:30am NBC: These two played a playoff series for the ages last year. Get a taste of it here. LA Clippers at Oklahoma City Thunder – 10am ABC: It’s like watching an All-Star game but different. Anaheim Ducks at Tampa Bay Lightning – 2pm NHL GameCenter: The best in the west takes on the best in the east. Atlanta Hawks at Memphis Grizzlies – 3pm NBA League Pass: The Hawks have to play two divisional leaders one weekend. Ouch. Montreal Canadiens at Boston Bruins – 4:30pm NBCSN: Original six matchup and one of the oldest rivalries in hockey. It’s no secret that the Seattle Seahawks called a pass play on 2nd and goal instead of a run play. It’s been debated, replayed and questioned to death but it just won’t die. In reality it’s death has provided us with a clinic on how to handle defeat. We’re not going to replay what happened because you already know. What’s more impressive is that this play will not go away. We couldn’t forget last years Super Bowl quickly enough and now we don’t seem to want to let this one go. From major media companies to the social media stratosphere. What’s being called the ‘worst play call in Super Bowl history’ has a life of it’s own. 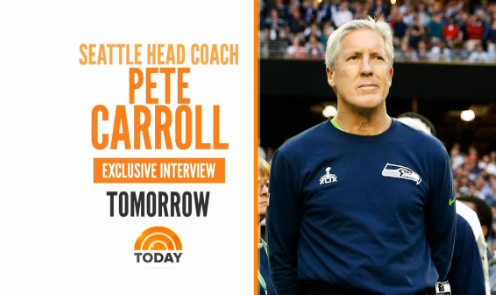 If you were watching the Boston Bruins at New York Rangers game on NBCSN you probably saw a tease for the Today show on Thursday where Matt Lauer sits down with Pete Carroll. It’s being promoted like a major expose or something. Even the opposing coach, Bill Belichick, is telling people to back off. Like a lot of us, Belichick knows that A) it was a great play by New England Patriots defensive back Malcolm Butler and B) if Butler doesn’t make the play people would be pushing for Belichick and Tom Brady to retire and talking about a dynasty out in Seattle. Instead of questioning we should be celebrating how head coach Pete Carroll and quarterback Russell Wilson are handling the situation. They, and just about the rest of the Seattle organization, has handled the repeated questions with grace and dignity. Their coolness under fire should become a college course they’ve done it so well. It’s called a game of inches for a reason. Now the repercussion of those inches has a life of it’s own. From the Washington Post to twitter to the intro of the Nashville Predators mascot Gnash (‘He knows to run the ball on 2nd and goal!’) before a home game against the Toronto Maple Leafs. You can’t escape it no matter how well the principles handle the onslaught. 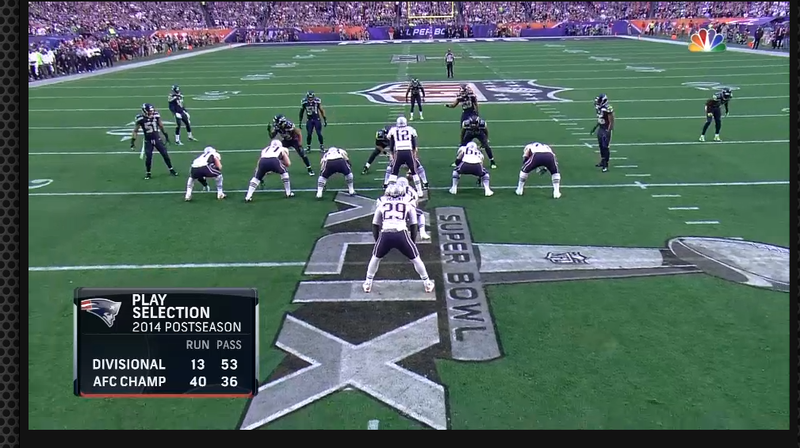 It’s 2015 and you can watch the Super Bowl on just about any device you wanted to. Streaming technology has gotten to a place where people now expect great quality. While all this should be expected, what is new is the fact that you can watch the game without confirming your cable or satellite subscription. As you can imagine, the video stream did some big numbers as Streaming Media’s EVP Dan Rayburn tweeted out after the game. Even with that many people, the stream quality was top notch. While this is a lot of people, it is well behind the 5.3 million who watched the USA vs Belgium World Cup match this past summer. The Super Bowl is a free, over the air event. It would make sense that if the event was streamed (which is was) and that anyone would be able to watch the game online. NBC thought so too and did not require you to have a cable or satellite subscription to watch the game through NBCSports.com which was a first. NBC didn’t take full advantage of the live stream though. There was only a stream of the game. There wasn’t a ’22’ angle or a ‘skycam’ angle. The experience lacked in a lot of ways. They could have done a lot more like ESPN did during the College Football National Championship game but chose not to. Not only was it a great Super Bowl but it was also a well executed one by NBC. The live stream was of quality, was stable and served the cord cutters. While NBC could have done more with the medium, it at least allowed fans to watch a great event for free.